An inspired story and homage to the 1950’s American television series “The Twilight Zone”. 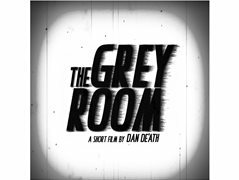 The Grey Room encapsulates the setting of an unlisted government facility nestled deep in the Nevada desert. Within it’s confines; four of the US military’s top scientific minds; Kevin, Jeff, Frank and Axel are together locked within a steel vault containing classified material, the likes of which remain sealed for three days until the timer counts down to zero. Experience with boom operation is required.